Running on a campaign of change, President-elect Barack Obama took the election in an electoral landslide. (Pause for cyber cheers and cyber boos…) And while people are generally used to politicians backtracking on their election platforms, Obama has already made good on his continued promise to enact change. And it came in the form of the newly launched website Change.gov. The interactive website is just one more way Obama is harnessing the amazing power inherent in the internet. He used it to great success during his campaign, finishing the story of triumph that looked to be Howard Dean’s in 2004. That is, had he not done this. Enacting a viral campaign, Obama won over the youth vote and organized masses of people in unprecedented numbers. He even hired Chris Hughes, better known as the co-founder of Facebook, to coordinate his social networking campaign. Under his direction, My.BarackObama.com served as the social networking hub where all the supporters could congregate online. This far exceeded any online efforts from the McCain camp. And Obama’s staying true to the medium that treated him so well. 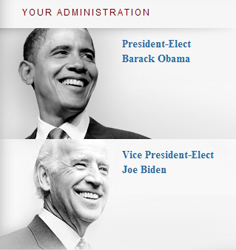 Change.gov is touted on its banner as “Office of the President-elect,” but apparently it’s not just Obama’s office. It’s America’s office. Sure, it has all the obligatory pages like biographies for Obama and Biden and a newsroom section for relevant media stories, but it also has some unexpected features that might make you think twice before dismissing it as just another political tool. -Share Your Story: After filling out a simple online form, you can interact with the online community that helped elect Obama. An open forum, you can discuss what his win means to you. In fact, you’re free to submit anything from hopes for the next four years to stories of your own involvement in the election. -Share Your Vision: Again, you do have to go through the online red tape of filling out a form with your email, name, and zip code. But once you get past that, you are free to lay out what constitutes your ideal America. Commiserate with other Obamaniacs, and hash it out with McCain-ites. -Apply for a Job: Although people have a legitimate right to gripe about the unemployment rate in the United States right now, there is (you guessed it) another online form to apply for jobs in the Obama-Biden administration. There are also non-career positions for those of us who aren’t quite equipped yet to serve in the presidential cabinet. The website also details Obama’s agenda on hot button issues like revitalizing the economy, ending the war in Iraq, and health care for all. Granted, I’m not such an idealist that I believe one website with a few slots for community input can turn a nation around. But I do believe that acknowledging the internet and its ability to bring people together is a huge step in the right direction. A president shouldn’t be an unreachable figure on a pedestal, and feeling like there’s a venue for your individual opinion might just begin to heal some of our national wounds.